The solid stainless steel case includes a bezel studded withbeautiful Swarovski crystals, and the dial has a genuinemother-of-pearl inlay. The Roman numeral and Swarovski crystalmarkers are individually applied. Automatic movement winds with the movement of your arm. It isrecommended that you wind the watch every two weeks. This watch just looks classy. The crystals around the watch face have just enough sparkle to catch your eye with out over powering the rest of the watch. The leather wrist band is excellent quality and doesn't rub or chafe. The whole for the strap don't quite fit my wrist correctly, however with it being leather the material will eventually stretch out enough to give me a comfortable fit. Very pretty watch, I have three watches by stuhrling. These are great watches, automatic wind so no more batteries to buy. It’s not too big to look feminine. 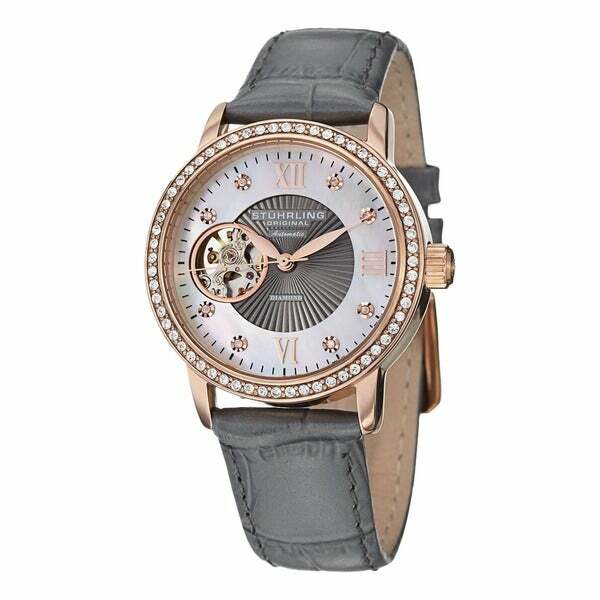 This is a beautiful watch - very stylish, well made and looks attractive when worn with many types of style outfits. I purchased an automatic winder as I do not wear the watch daily (although I could, it's just that I have several style watches for various outfits). It is a purchase I am very pleased with. Looks very nice. And can't tell more than this. Haven't had it to long. I highly recommend this watch, style, looks, price, you can't go wrong with this watch. I gave it to my wife as a gift, she was in total shock!, her comment was it was beautiful and one of the best present she had received. she loves her watch! I love this watch! It is just gorgeous. It is a little big for my small wrist but I am keeping it because I love how it looks. Keeps good time and there is no need to bother with a battery. Definitely recommend! i love this watch it look so good wearing it. i wore it to work today. loved it and its a beautiful watch. Stylish, however, the price was not competitive compared to other retailers. The watch is quite nice, but recommend looking around for the identical watch before purchasing.